Serious People were saying that budget deficits hurt the economy. Then we increased taxes on the rich so now deficits are wayyyyy down. So Serious People are saying that taxes hurt the economy. Or is it spending on schools and infrastructure that is going to kill the economy. Wait, it’s the new health care law — millions of people getting coverage is going to kill the economy. How come Serious People never complain that cutting schools, infrastructure maintenance, Social Security, scientific research (and other things We the People spend money on to make our lives better) really, actually does hurt the economy? Translation from government to English: The top tax rate used to be over 90% and capital gains taxes used to be much higher. At that time economic growth was much higher. Then they dramatically lowered tax rates for the rich and economic growth went waaaaay down. (However, they can’t say for sure that cutting taxes on the rich caused the huge drop in economic growth.) Also the tax cuts didn’t boost saving, investment or productivity growth. BUT the rate-lowering appears to have caused incomes to concentrate at the top, which has screwed and squeezed the rest of us. And, by the way, the tax cut did cause massive deficits and we stopped maintaining and modernizing our infrastructure, cut back on education, universtities, scientific research, space exploration, medical research and so many other things that We, the People do to make our lives better. You might not have heard about this study. Senate Republicans made the CRS withdraw the report. 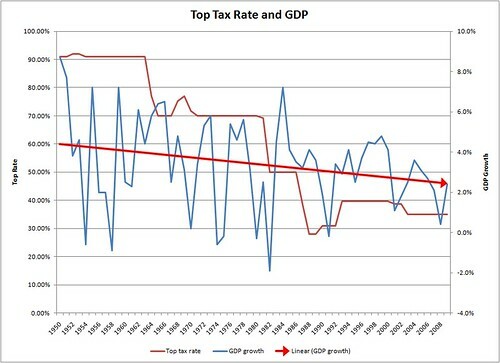 Here is a chart I made some time ago, for the post, Conservative Tax Tricks – Did Tax Cuts Grow The Economy? Government the Job Killer – John Stossel. In this one Stossel claims that building infrastructure is bad for the economy. “Building giant government projects is no way to create jobs. When government spends on infrastructure, it takes money away from projects that consumers might think are more important.” He actually claims that building the transcontinental railroad was a bad deal for the country. And of course never forget, “Nothing is more important in the face of a war than cutting taxes.” – Tom DeLay, House Republican leader, 2003. Why do we listen to these clowns at all? (Because they are backed by the big, big money people who get all the money that come from these Republican schemes.) Why don’t we just create millions of jobs by investing in infrastructure and similar projects? 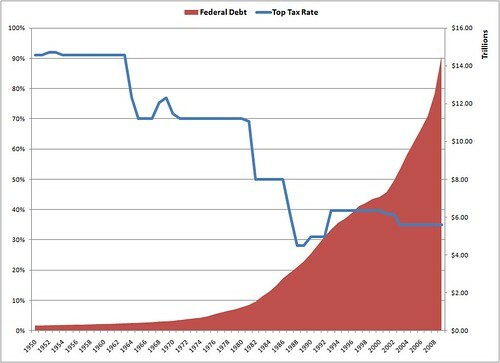 Why don’t we just restore a top tax rate of 90% and a top corporate tax rate of 50%? Why don’t we boost capital gains taxes? Does it have something to do with the influence of money over politics?